On a hot summer day when it is 90º on the street, it can be twice as hot on the roof of most commercial buildings with a significant number of them made of black tar. Black roofs result in higher utility bills due to the higher HVAC costs. An alternative that is increasingly available is a “green” roof. Further, green roofs can provide useable outdoor patio spaces which, according to a an article entitled “10 Most Wanted Office Amenities” in the 9/3/2015 National Real Estate Investor, is the seventh most desired amenity based on a survey conducted by Colliers International Group Inc.
A green roof is built like traditional roofs except a final layer of vegetation and soil, or a growing medium, is planted over a waterproofing membrane. Additional layers, such as a root barrier and drainage and irrigation systems may also be included. According to the GSA Green Roof Report green roofs consist of a waterproofing membrane, growing medium (soil), and vegetation (plants) overlying a traditional roof. Green roofs are used to achieve environmental benefits including reducing storm water runoff, energy use, and the heat island effect. They are sometimes referred to as vegetated roofs or eco-roofs. The history of green roofs started in ancient Mesopotamia where rooftop plants were grown from the Ziggurat of Nanna to the fabled Hanging Gardens of Babylon, one of the Seven Wonders of the World. 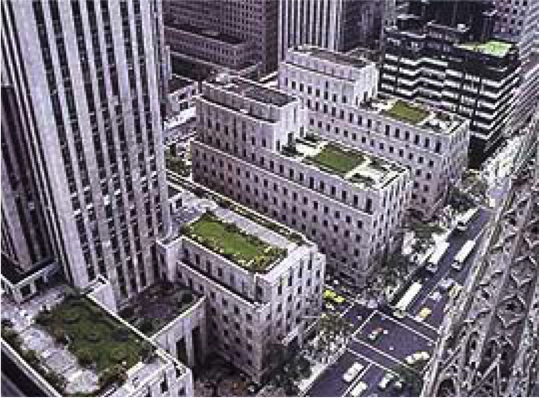 The most recognizable green roofs in America were installed on Rockefeller Center in New York City. They continue to flourish today (see photo). More recent examples are the Gap Headquarters in San Bruno, CA and the Ford Motor Co. headquarters in Dearborn, MI. Green roofs can be either “Intensive” or “Extensive.” Intensive roofs have thick soil depths with elaborate plantings that include shrubs and trees that require heavy load-bearing roof structures and regular maintenance. Extensive green roofs are mush lighter with shallow soils with low-growing ground cover plants that are extremely sun and drought tolerant. Extensive green roofs can be installed over various roof decks and require periodic maintenance. Most urban and suburban areas contain large amounts of paved or constructed surfaces which prevent stormwater from being absorbed into the ground. The resulting excess runoff damages water quality by sweeping pollutants into water bodies. Green roofs can reduce the flow of stormwater from a roof and delay the flow rate. Green roofs reduce building energy demand by cooling roofs and providing shade, thermal mass and insulation. Green roofs can earn LEED points in several credit categories. The total points achieved will depend upon the size of the roof and the degree to which various features are incorporated into the overall building design. These include but are not limited to storm water design, reduced heat island effect, habitat provided for wildlife, reduced cooling load, and many others. Green roofs help to reclaim green space and promote biodiversity. LEED is a rating system developed by the U.S. Green Building Council (USGBC). It provides a standard certification process with five key areas of human and environmental health. It provides a roadmap to measuring and documenting success for every building type and phase of building lifecycle. LEED certification is achieved by earning points for a variety of credits. Green roofs help to reduce excess storm water discharge through evapotranspiration, periods of longer infiltration, or capture and reuse. In addition to reduced utility costs, the benefits of a green roof include: (a) reduction of water runoff; (b) reduced sewage system loads by assimilating large amounts of rainwater (3” to 5” of soil absorbs 75% of rain events that are on-half inch or less); (c) protects the underlying roof material by eliminating exposure to UV radiation and extreme temperature fluctuations resulting in a longer lasting roof system. Other benefits include reduction of air and noise pollution, creation of urban living environments for birds, provision of useable outdoor patio spaces, as previously mentioned, and enhancement of a property’s marketability (especially when multiple elevations are incorporated into a project resulting in views overlooking other rooftops). Up-front costs of an extensive roof in the US starts around $8 psf all-in. By comparison, a traditional roof starts at $1.25 with cool roof membranes starting at $1.50 psf. However, the additional installation costs are off-set by energy savings and the extended life of the roof and possible savings on the storm water infrastructure. Finally, a property with a green roof will be more marketable to prospective tenants. The benefits of a green roof are innumerable for building owners and occupants, the built environment, and the natural environment. Green roofs are a primary example of the advances in environmentally friendly systems that are available to enhance your commercial properties. Is Your Building Conducive to the Installation of a Green Roof? Any reason for installing green roofs on a building—whether it’s to save money or the environment—is a good reason. According to the Green Roofs for Healthy Cities (GRHC) association, the North American green roof industry grew by a remarkable 24 percent in 2012. Part of this growth was spurred on by more cities recognizing the public benefits of green roofs and taking various policy measures to encourage their widespread installation. However, according to GRHC there is still enormous potential for growth of new green roofs on billions of square feet of buildings across North America. Despite the potential, installing a green roof is not a decision to be taken lightly. There are several structural and site/location considerations to take into account. The most recent news of a probable green roof collapse at a Latvian supermarket should give one pause. Before allocating the time and resources, facility owners and managers should weigh the pros and cons of a green roof and what to keep in mind during the planning stages. First, you need to consider the load capabilities of the building. The space that is designated for the green roof: Is it able to sustain the weight for the items that will be designed and placed on top of the roof? If the live weight load (after snow, for example) is less than 35 pounds per square foot, it will be harder to establish a green roof. Second, consider the design intent of the green roof. Is the space going to be an area that individuals will be able to visit and enjoy up close, or is the green roof only to be viewed from a window, door, patio, etc? Third, take into account the location and climate of the intended green roof. A common misconception about green roofs is that they must always be green and vegetative, but there are several possibilities. However, one needs to consider the climate and the exposure. For example, the west side of a building is going to have a tremendous amount of sun and heat, so plant materials will need to be suited to sustain themselves in this environment. The north side will receive colder northern winds and can be more heavily impacted by freezing temperatures. In many instances the natural environment is not the only factor to consider when designing a green roof environment. Microclimates will also be created from the structure surrounding the space. For instance, radiant heat will increase exponentially when planting next to mirrored glass. Overhangs will create opportunities for shade gardens. Planting soil depths and soil material makeup will determine how quickly or slowly a space will dry out in rainy or dry seasons. Fourth, consider irrigation and drainage. Drainage is key in making sure that rooftop gardens do not become pools. Rock gardens are commonly used in situations where irrigation cannot be provided and temperatures are determined to be too extreme in a green roof environment. Draining and irrigation issues can be solved with construction, but this will add costs to any budget. Finally, one must ask if a green roof is the best choice for achieving goals. Many of the functions of a green roof can be achieved through other means. For example, rainwater from roofs can be recycled for irrigation. Heat can be mitigated by shade trees, which are the backbone of the ecology and support far more beneficial insects than most green roofs ever will. In an urban environment, where there is almost no ecology and nature has been paved over, green roofs can play a vital role. In a suburban environment, however, the functionality of green roofs may become harder to justify when one looks at other alternatives. According to the Environmental Health Research Foundation, each day a 50-foot by 50-foot green space releases enough oxygen to support a family of four, and the Center for Disease Control and Prevention (CDC) points to the positive mental health benefits of being exposed to parks and green spaces. Green roofs offer various opportunities for owners and employees to experience a little bit of nature. For example, the Fairmont Hotel in downtown Dallas developed a vegetable garden green roof, which allows the kitchen to provide fresh, locally grown herbs, spices and seasonal vegetables that go straight from the garden to the plate. At the University of North Texas (UNT) Business Leadership building, a series of outdoor green roof spaces created by Southern Botanical and Lindsey White of Caye Cook and Associates allows students and faculty an opportunity to leave the classroom and office to take a break to reflect and study. These spaces also help with the conservation of energy for the facility by increasing natural lighting within interior rooms and corridors. In turn, the increased natural light offers an opportunity to save on energy and lighting costs for the facility. But there are also some concrete reasons for installing a green roof. Green roofs can protect the roof membrane from elements that can be destructive, such as extreme heat and cold, water, mechanical damage and ultraviolet rays. In some cases, a green roof can double or triple the life of the membrane when properly installed and maintained. Additionally, there are energy savings since a green roof acts as an insulator. Green roofs can also mitigate the heat island effect, reduce rainwater runoff, and to some extent, replace the flora that was destroyed by the footprint of the building. For many cities, a compelling reason for green roofs is to offset the underlying, weak urban infrastructure that is overwhelmed by rainwater runoff. New York City, for example, has an antiquated sewage system which, when overwhelmed by rainwater, forces the city to dump raw sewage into local bodies of water and makes New York beaches unusable for several days thereafter. In this instance, green roofs absorb 80 percent of the water that lands on them, so they can be a strategy to reduce the amount of water that reaches urban infrastructures. The USGBC and its LEED certification program are spurring on the design and installation of green roofs all over the country. There are some regional variations, but that is often tied to climate. In Texas, for example, extreme temperatures can be somewhat of a limiting factor. The increase in green roofs is often a matter of education, cost and technology, but signs indicate that they will become more productive and/or habitat-oriented. Green roofs will become popular as a site for food production, a habitat for beneficial insects, a way station for migratory birds and so on. This is a trend that is already happening in some cities and will continue to expand as food prices rise, and natural habitats continue to be reduced by population pressure. And green roofs will continue to grow as a market segment as they establish track records and are supported by legislation. For example, New York City gives a tax rebate for green roofs more than a certain square footage because the city recognizes that every square foot of green roof means less money it will have to spend upgrading the sewer and rainwater infrastructure. In the end, consider function first and make sure your building and location are amenable to a green roof, or be clear on the extent of changes that need to be made and costs that need to be incurred for it to function properly and safely. Then be clear on the “why.” If the “why” is that you want to reap the qualitative benefits for employees and the environment, that is okay, too. Built along the Chicago River by Hines, 300 North LaSalle, a 57-story, 1.3 million-square-foot Class A office tower in Chicago was designed to be extremely energy efficient with a façade of articulated glass and stainless steel that maximizes daylight and minimizes solar gain. It has a green roof and water and energy conservation systems. Tenants and property managers recycle paper, glass, aluminum and plastic. The tower has earned Platinum and Gold LEED certifications from the U.S. Green Building Council – Platinum for Existing Buildings and Gold for its Core & Shell. Owned by KBS REIT II and managed by Hines, it is one of two Hines-related properties highlighted by the USGBC in its ranking of the Top 10 States for LEED. The other Hines building cited by the USGBC is Fifty South Sixth, a 29-story, Class A office tower in Minneapolis. The 698,600-square-foot building developed and owned by Hines has LEED Gold certification. Green features include energy efficient lighting with reduced mercury content; use of environmentally safe cleaning products and practices; water use reduction and a comprehensive recycling program. At both buildings, Hines offers its GREEN OFFICE for Tenants program, which assists the tenants in ways to reduce their carbon footprints. “We have continually sought new ways to maximize the efficiency of our buildings and are leading the industry with new building strategies and putting technologies into practice in an economically viable way, which is evidenced by our La Jolla Commons project (in San Diego) with LPL Financial – the largest net-zero energy building developed for lease in the U.S.,” Holtzer added. Topping the USGBC list was Illinois with 171 projects certified in 2013 for a total of 29,415,284 square feet and a per-capita square footage of 2.29. Maryland followed with 119 certified projects in 2013 for a total of 12,696,429 square feet for a per-capita square footage of 2.20. Virginia placed third with 160 properties and 16,868,693 square feet receiving LEED certifications in 2013 for a per-capital square footage of 2.11. Massachusetts came in fourth with 101 projects certified in 2013 and 13,684,430 square feet for a per-capita square footage of 2.09. Rounding out the top 5 were New York and California, which tied. New York had 259 projects certified in 2013 and 37,839,395 square feet for a per-capita square footage of 1.95. California had 595 projects certified in 2013 and 72,729476 square feet for a per-capita square footage of 1.95. Oregon placed sixth, followed by North Carolina, Colorado, Hawaii and Minnesota. Since Washington, D.C., is a federal district it was not ranked but it had 106 projects certified in 2013 and 19,524,216 square feet for a per-capita square footage of 32.45. USGBC calculates the list using per-capita figures as a measure of the human element of the green building, allowing for a fair comparison among states with population differences and number of overall buildings, the council said. It is based on 2010 U.S. Census data and includes commercial and institutional green building projects that were certified throughout 2013. Making the list for the first time were Oregon, which certified 47 projects representing 1.83 square feet per person; North Carolina with 133 projects representing1.80 square feet per resident; Hawaii with17 projects and 1.71 square feet per resident and Minnesota with 51 projects certified or 1.55 square feet per resident. “The list of the Top 10 States for LEED is a continuing indicator of the widespread recognition of our national imperative to create healthier, high-performing buildings that are better for the environment as well as the people who use them every day,” Rick Fedrizzi, president, CEO & founding chair of USGBC, said in a news release. Skanska USA, another commercial real estate firm focused on sustainable building practices, had several properties included in the USGBC report. One is 1776 Wilson Boulevard, a 139,593-square-foot office and retail building that is the first LEED Platinum property in Arlington, Va. It has a green roof, solar panel, fitness center, bicycle storage and is located within walking distance of two Metro train stations. The second property noted by USGBC is Skanska USA’s own office building in Rockville, Md. The 13,000-square-foot office building at 700 King Farm Boulevard achieved LEED Gold certification for the interior space. DCS Design, the McLean, Va.-based architecture and design firm responsible for the interior said on its website that glass walls, partitions, workstation panels and doors were used throughout the office to bring in natural light. The firm used salvaged materials and recycled finishes, fixtures and furniture. The USGBC list included other notable green projects such as Aulani, A Disney Resort & Spa in Kapolei, Hawaii, LEED Silver; M&T Bank Stadium in Baltimore, LEED Gold; Barclays Center in Brooklyn, N.Y., LEED Silver. The Carlton College Weitz Center for Creativity in Northfield, Minn., received LEED Gold, the college’s third project to earn LEED certification.